Manufactured from heavy gauge, hardened steel, epoxy coated. Features top staple loading, no removable parts, deep reach (throat depth), opens for tacking, and has a blunt clinching anvil. A sword-point carton-stitching (CS) anvil model is also available, on special request. Its many uses include: Attaching header cards; Sealing padded mailing envelops securely; Securely seals end caps of mailing tubes; Insulation/HVAC stitching, and many other industrial applications. 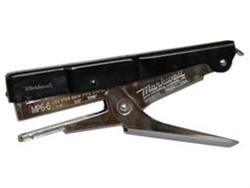 Uses STCR5019 series staples, 1/4" and 3/8" galvanized and 3/8" stainless steel. All hardened heavy steel construction.